Nikki Haley's public spat with the White House has underscored Trump World's obsession about the political ambitions of people in the president's orbit. Her cutting rejoinder - "with all due respect, I don't get confused" - earned cheers from people who called it an example of resolve from a strong female leader and boos from others who accused her of disloyalty for going after one of Trump's newest handpicked aides. "Clearly she has machinations for higher office and will do anything to continue rising, even if it eventually means throwing President Trump and his administration under the bus," said one former White House official. 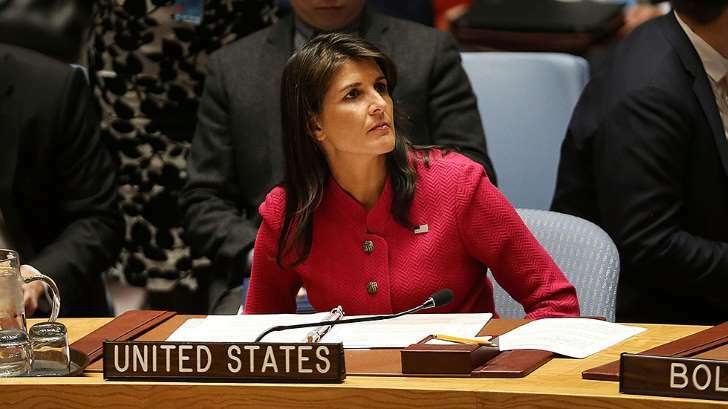 Haley's office did not respond to a request for comment on this story, but the former South Carolina governor told reporters on Wednesday that her relationship with Trump is "perfect," according to Reuters. A former Haley staffer called her "the most loyal politician I've ever been around," adding that "it is unfair to say somehow she is disloyal to the president and just looking out for her political future." Haley is one of the administration's most outspoken critics of the Kremlin, while Trump has often taken a less aggressive approach in hopes of forging a closer relationship with Russian President Vladimir Putin. "Trump's frustration has been building because it looks like she's trying to outmaneuver the president while she works for him," said one Republican with close ties to the White House. "We'll see if she actually starts doing her job instead of trying to be secretary of State or secretary of Defense." The friction over Russia drew additional notice because a day earlier Trump had quashed an effort by Vice President Pence to hire Haley's deputy, Jon Lerner, as his national security adviser while Lerner continued serving at the U.N.
Two Trump supporters blamed the situation on Pence's chief of staff, Nick Ayers, who brought Lerner aboard. Ayers, a veteran GOP operative who has worked on campaigns with Lerner, is seen as being tasked with protecting the vice president's political brand. He's seen as more of a specialist in politics than national security, which led many to see Lerner's joining the veep's team as a political move. Trump's White House has been characterized by infighting, and some say anyone suggesting that Pence, Haley and their subordinates are plotting a political future together are simply trying to cause problems and divide Trump from Haley. "No, this laughable conspiracy theory is totally false and beyond belief - even by Washington's standards," Pence press secretary Alyssa Farah said in a statement. A GOP strategist in contact with the White House said "there is no doubt" that Haley has eyes on a higher office, but that it is highly unlikely she will be running for the White House in the near term. At the age of 46, Haley's future in politics could go beyond Trump's presidency - which his supporters expect to last through 2024. Haley's defenders say it is natural for her speak out to maintain her integrity when she is criticized publicly. "She has to stand up for herself because she is being characterized as confused," said the GOP strategist. "Clearly, she does not move without coordinating with the White House. Because she has higher ambitions, she felt the need to correct the record publicly." While Haley's sanctions comments angered Trump, it's not clear that he has completely soured on her. "I think it is a question of competency and she is obviously competent," said the former White House official when asked about the president's feelings about Haley. "She is a well-spoken female conservative and for better or for worse, that goes a long way with a lot of people. There is a deficit of that in the GOP," the former official said.